To prepare the vegetables for roasting, I peeled, halved and cut the red onions into wedges, and I sliced the pepper, discarding the stalk and seeds and cut it into chunks which I tossed in a little olive oil, salt and pepper. Yep, just the average prep. 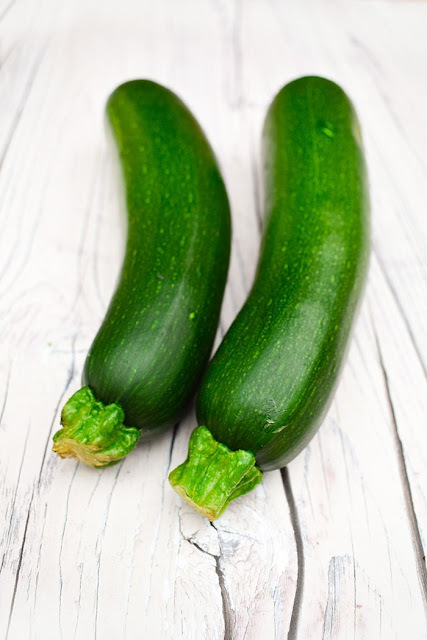 The courgettes were sliced and the aubergine was sliced and then the slices were cut to a more suitable size. Instead of tossing these vegetables in olive oil and seasoning them, I brushed them with pesto and harissa paste respectively. I hold my hands up and admit I was daydreaming and it didn't go to plan. I was planning to brush the aubergine with the harissa and the courgette with the pesto, but wasn't paying attention so ended up doing it the other way around. The courgette got the harissa and the aubergine the pesto and do you know what, it really didn't matter as they both tasted delicious, so I will leave it for you to decide what you brush on each. I spread all the prepared vegetables in a single layer on a tray (you could use a roasting tin) and popped them in a pre-heated oven to roast. Always give vegetables room to roast. They need to lie in a single layer with a bit of space. If they are lying on top of each other then they will merely steam and you will end up with wet vegetables instead of the roasty vegetable goodness with crisp edges. I did pop the tomatoes on top, but the main period of roasting was done when I added them, so the other vegetables had already had a chance to roast and crisp. Once the vegetables had been cooking for 20 minutes, I took them out and gave them a wee shoogle to make sure they weren't sticking to the pan, then added cherry tomatoes and cloves of garlic. The tomatoes go in towards the end of cooking time as they don't need as long and same for the garlic cloves, especially if they are on the small side. If the cloves are massive you could put them in at the beginning, but generally I prefer to add them further on in the cooking time. Throw the garlic cloves in whole, don't remove their papery skin as it will protect them and they will get nice and gooey inside. At the end of the roast, you can just squeeze out the unctuous garlicky puree from each papery clove. Once the veg are out of the oven I scatter a handful of rocket over the vegetables, which will soften a little from the warm vegetables, but that's OK. The rocket gives a peppery finish which contrasts well with all the rich flavours. This vegetable mixture is now ready to be added to a dish and there are so many dishes you can add this Mediterranean bake to. Check out my ideas below. Make up a batch of couscous, bulgur wheat or quinoa and toss with the roasted vegetables and serve. Toss the roast vegetables through freshly cooked pasta with some pasta sauce. Deeply fill wraps, sandwiches and pitta pockets with salad leaves, roast vegetables and cream cheese. Use the roast vegetables as a filling for quesadillas with mozzarella. 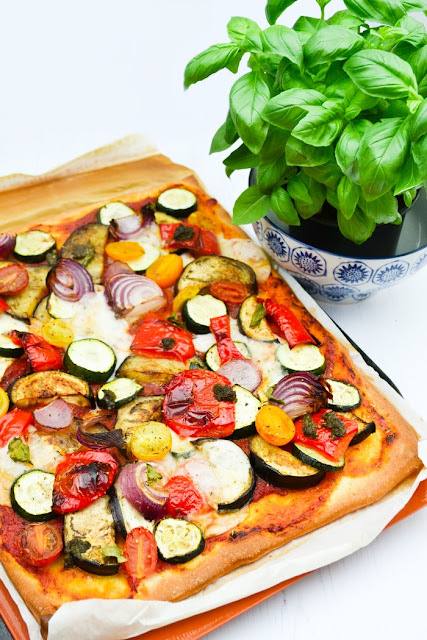 Top a bog standard margherita pizza with the roasted vegetables and rocket for a luxurious treat. Brown some ready made gnocchi in a pan, then add some tomato pasta sauce and mix through the roast vegetables. Top with some freshly grated parmesan. Use the vegetables and rocket as a filling for a baked potato with grated cheddar. Serve with lots of salad greens and some dressing as a filling winter salad. Feta cheese is an optional but delicious topping. Make a deep lasagne. start with a layer of tomato sauce, then a layer of lasagne sheets, another generous layer of sauce, topped with the veggies, then another layer of sheets, sauce and veggies, topped with a layer of sheets, cheese sauce (veggie or vegan), then mozzarella and a generous grating of parmesan. Bake until golden and crispy at the edges and serve with a green salad and garlic bread. Make a pasta salad. Cook the pasta according to the packet ingredients until al dente, rinse under cold water until cold and glossy, shake off the excess water, then toss back in the pan with some pesto, the roast vegetables, rocket and some sweetcorn. Serve for lunch dinner or as a side. Add them to a blender with vegetable stock, salt and pepper to make a tasty soup. Add them to a blender with passata, tomato puree and some fresh basil to make a smooth pasta sauce. Make a creamy vegetable risotto with the veggies, just at them at the end. Top burgers in buns with roast vegetables. Pimp hot dogs with roast veg and tomato relish and/or mustard. Fill tacos with the roast vegetables and salsa and top with grated cheese or guacamole. Make a delicious crispy deep-filled toastie. Spread with pesto and fill with roast veggies and mozzarella. Serve with fried rice and some sweet chilli or sweet and sour sauce. Add chopped tomatoes and cook gently to make a tasty ratatouille. 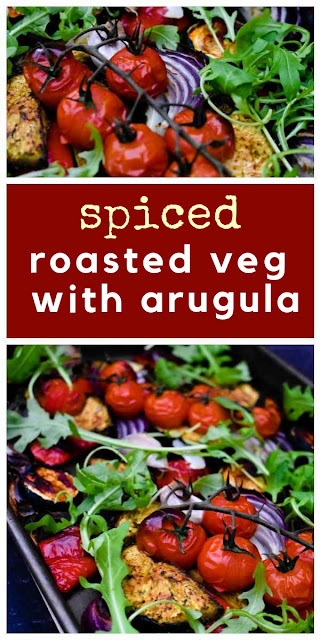 Spiced Mediterranean vegetables mixed with spiced and roasted in a sheet pan, then finished with rocket (arugula) is a basic dish that can be used as the basis of so many dishes. Check out my guide 20 Ways To Use Roasted Vegetables. Preheat the oven to 190c/170c fan/375f/gas mark 5. Toss the prepared onions and red pepper in olive oil, then season with salt and pepper. Brush the aubergine with harissa paste and the courgette with pesto (or the other way around). 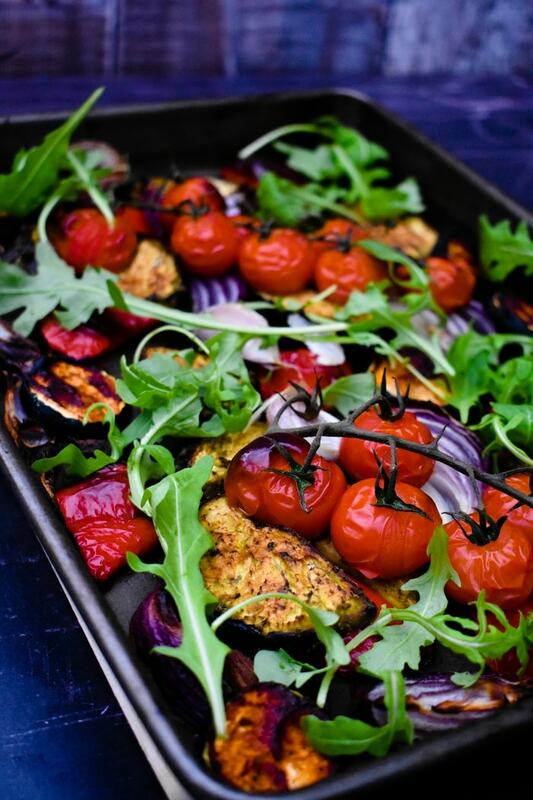 Place the vegetables in a single layer on one or two baking trays, sheet pans or roasting pans. I needed two. Roast in your pre-heated oven for 20 minutes, then add the cherry tomatoes and garlic and roast for another 10 minutes. Keeping an eye on them to make sure they don't brown too much. Remove from the oven and top with rocket leaves and serve or add to another dish (see the 20 serving suggestions above). The most amazing dairy free pizza, generously topped with roasted vegetables, dairy free cream cheese, pesto and fresh basil. I love roasted vegetables! It's such a delicious healthy snack! Oh yes and so good in many dishes. These look wonderful! 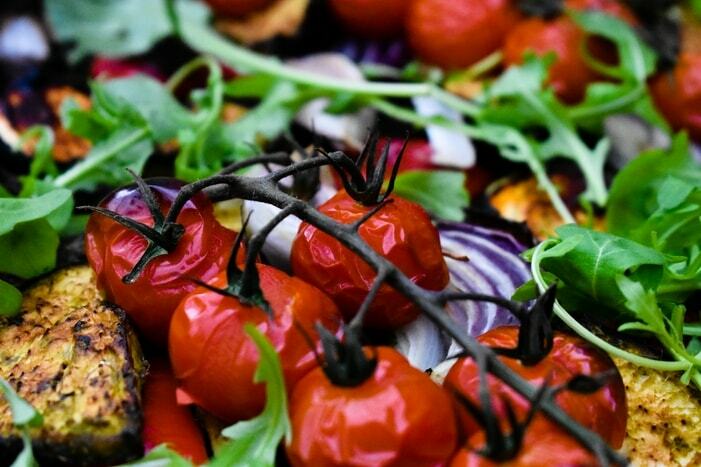 I love how veggies go when roasted; tomatoes burst with intense flavour, onions get sweeter.... oh now I want roasted veggies! I'm pretty picky with veg and I have to hide it in stuff to get my 5 a day, but roast me some veg and I'll just eat them with a spoon! Roasting is obviously the way for you to eat your veg and yes I agree about the flavours. 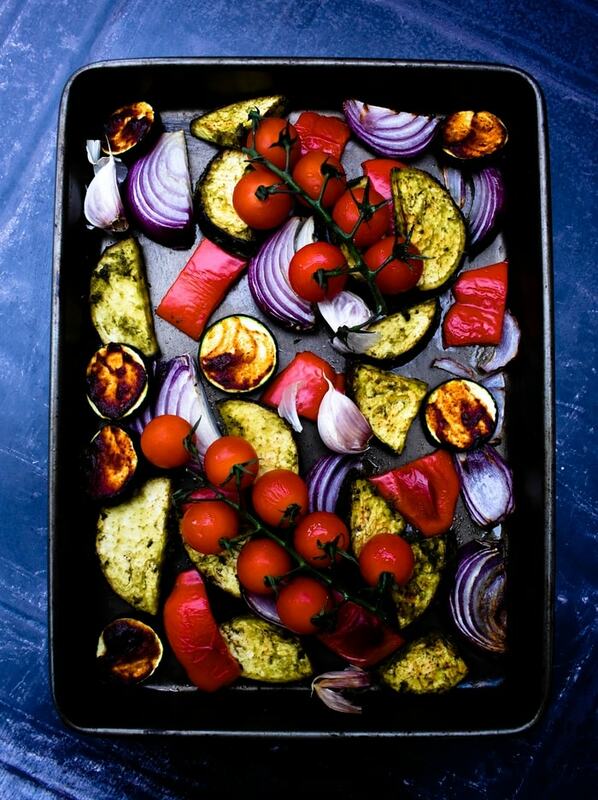 I'm a fan of healthy colorful dishes like this plate of roasted vegetables! You can't beat it for flavour. Your photos are gorgeous! Love how this turned out. I love roasted veggies! It's like MAGIC! 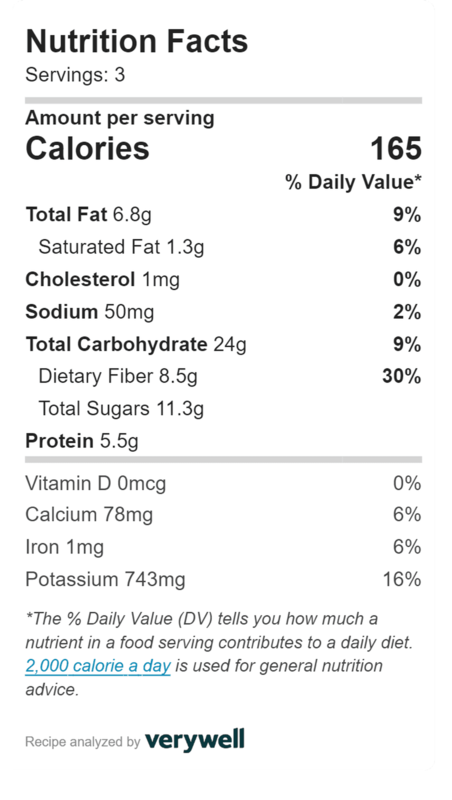 It's amazing how it totally transforms the flavors! I know, it gives a crazy amount of flavour to veg. Sheet Pan roasted vegetables are a great way of sneaking in lots of intensive flavors . So easy to make with tons of flavor. Love it! Get for getting hour five-a-day too. 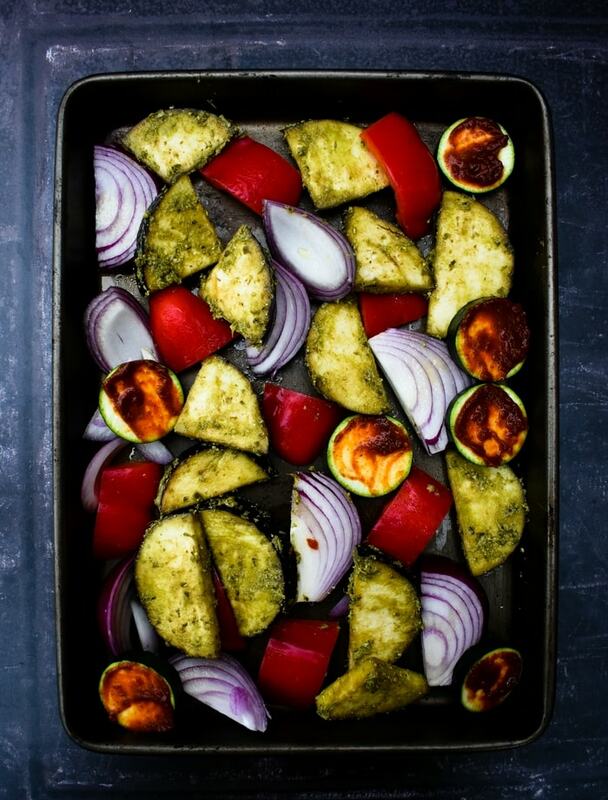 Roasting vegetables in a sheet pan is my favourite, especially when I'm kinda bored of salad, roasting is the best alternative. I love your list of 20 ways to use roasted veg, they are completely helpful! What a beautiful tray of vegetables! And to think that all those different colours represent different nutrients/antioxidants ❤️💚💜💛 Mother Nature is truly amazing isn't she?